What is the difference between Areas, Groups, and Layers? Why use one over the other? When you are organizing things in your diagram there are three options available to you for indicating associations: Areas, Groups, and Layers. It can sometimes be difficult understanding which you should choose. This article explains the differences and why you might choose one over the other. An icon, image, or text box can be a part of more than one Area if the Areas overlap. You can freely resize and move areas. A special handle is provided in the top right corner of an Area that allows for quickly moving and Area and its contents together. Areas have a transparent background, a dashed border, and an editable title. Areas are commonly used to group items together that are geographically related. You can use Areas to filter your inventory to see items relevant to a specific geographic location. You can also Pin Diagrams in a Document to an Area so that if you move or adjust the Area in your Diagram, the Document will always remain focused on the Pinned Area. Use the Area tool to click and drag a box where you would like the Area to be. Resize the Area to be the size that you desire. At least big enough to contain the contents that you want to fit in the Area. An icon, image, or text box can be part of more than one Layer. Areas and Groups may also be added to Layers. Layers have no size. They are an abstract container for items. Individual Layers can be turned on and off in order to hide the contents of the Layer from being visible. There are certain situations when Groups and Areas do not provide the flexibility you need. Most notably, if you want to relate two or more items in your diagram and it makes the most sense for them to be visually separate, a Group or Area may inadvertently capture more items than you intend. Layers can be used as a tag that you can later use to change the visibility of all items with a specific tag. Layer visibility can also be used in Documents to hide certain elements in your Diagram from customers that are viewing the Document. You can create a Layer at any time by using the layer button in the bottom left corner of the Diagram. 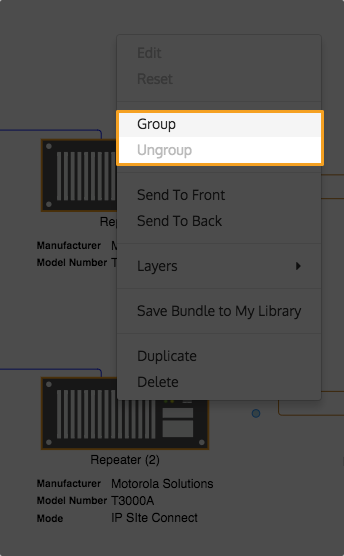 Add and remove items from Layers by selecting the items in the Diagram, right-clicking one of the selected items, and using the Layers submenu to select which Layers the item should be a part of. Note: Creating a new Layer while items in the Diagram are selected will add the selected items to the Layer. When you have some existing layers you will see them beside the create button in the bottom left of the Diagram. 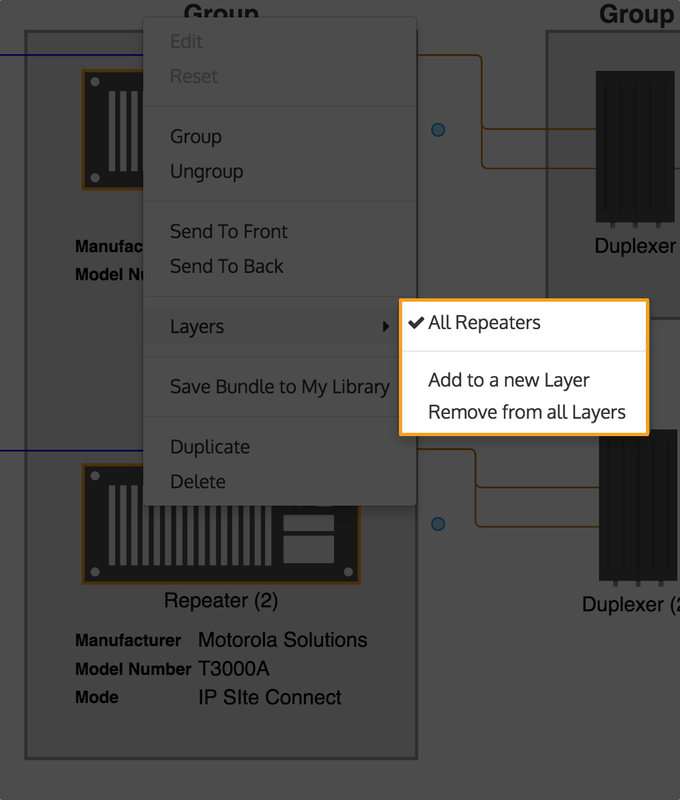 Hover over the name of the Layer to see everything in that Layer highlight in the Diagram. Click on the name of the Layer to toggle visibility of the items in that Layer.